Our last week and still so much to see and do! 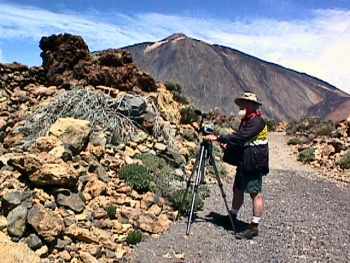 Today we are going up to Teide again. We are going to hike from the Teleferico (cable car) to the Parador (where we started our first hike on Day 8). 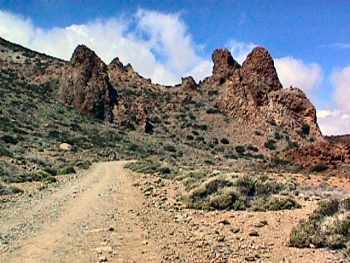 These are the Roques de Garcia that we hiked around on our first trip to Teide. 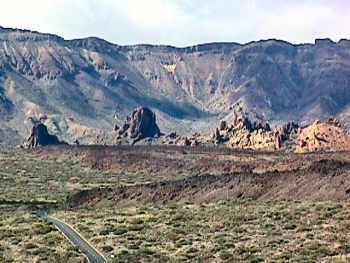 We are going to hike south to the rim of the Canadas crater and then to the Parador at the left end of the Roques - about 8 km. It took us over 3 hours, not because it was difficult going but because we stopped so often to take photos. 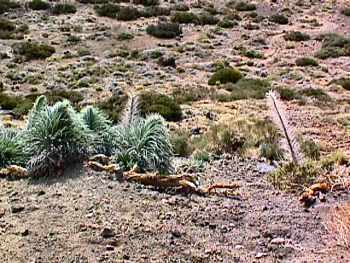 March/April is too early to see the taginastes in bloom but on the left are young plants and a flower stalk growing. On the right is a dead flower stalk. The plants take about 7 years to mature and flower, then they die. 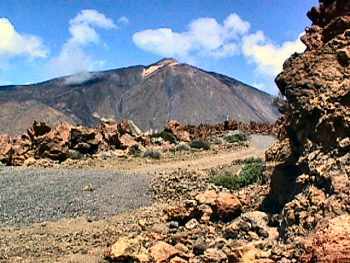 Looking back along the path we are following to Teide. We were glad of the fairly smooth track; hiking over the lava on either side of the track would have been very hard work. It is really remarkable how many flowers and plants are growing on the lava. It is surprisingly green although there is no sign of earth, just rock and more rock. 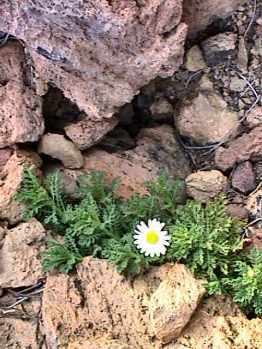 This is a Teide daisy. 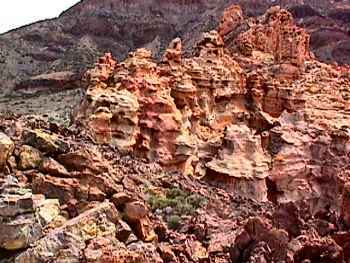 Stacks of lava that has thrust up above the floor of the Canadas. Fantastic landscape. We were fascinated by the Canary pine which had found a foothold and enough "food" to grow 20 or 30 metres tall so far up a cliff. 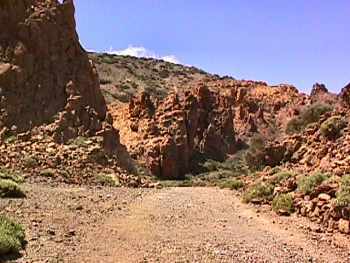 This is our path along the south rim of the Canadas, heading towards the Yellow Rocks. 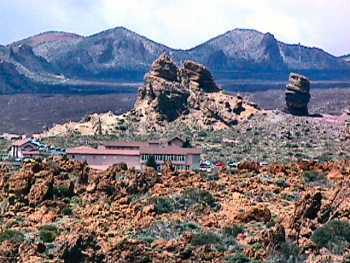 The Yellow Rocks (Piedras Amarillas) - I always thought lava was black until I went to Tenerife. We brought back a little rock collection - purple, green, pink, white, red, yellow, blue, and black which was almost obsidian. 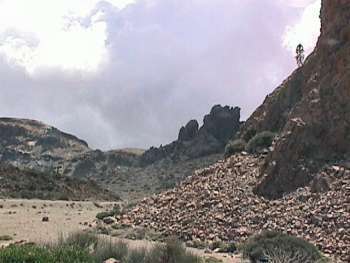 The end of the trail is in sight - the Parador Nacional de las Canadas y del Teide, to give it its full name. It is a hotel and restaurant and where we will get the bus. On the extreme left is the Chapel of the Snow (See Day 8) and behind it Los Roques. Again we had really good luck with the weather. Teide was in fog when we arrived. It cleared off and we had lovely sunshine but with a chill breeze. By the time we reached the Parador the cloud had come down and it rained while we were enjoying cake and a drink before the bus came.